Nick Varner is a professional pool player who has won Eight world championships and has been inducted into the Billiard Congress of America Hall of Fame. Nick is still actively playing and appeared at an exhibition in Helena, MT in 2014. Luckily for us, in addition to being really good at pool and billiards of all types, he knows the logistics of the game - and he's used this knowledge to create his own private line of pool cues. Using your own cue, no matter the cost or quality, can greatly improve your game. You get used to the feel and the hit of your own cue and it really helps. Knowing this, Nick has set up a line of cues of all price ranges, from the expensive elites to the more affordable cues for the rest of us. His World Championship line is currently his most popular, and it features the exact same cues he uses when he plays himself. That's a real endorsement - not a celebrity just saying he "likes" or "enjoys" a product. As you can imagine, though, these cues are quite expensive - not only are they elite, but they have the prestigious name of Nick Varner behind them. Most of the time, you'd have to look at the quality vs. price to consider if a pool cue is right for you. But in the case of Nick Varner, he's done a great job in creating pool cues for every skill level. This means you can buy one that's made of the cheapest materials possible, or you can buy one that's made of the best materials that he himself uses. It's up to you. Regardless of which offering you choose, know that you're getting the best value for your money. Even if you're buying a cheaper cue, you'll get the best materials and construction that you can for that price point - Nick puts his name behind each and every cue he sends out, and he doesn't tarnish his name with subpar cues - ever. 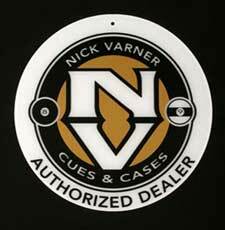 View our available billiards products at Nick Varner Cues and Cases. If you see anything that interests you, give me a call for pricing and purchasing info. I can ship products I have in stock or if you want something from the Nick Varner website that I don't have, they can ship directly to you. We'll arrange it all. Nick Varner Signature cues are priced for everyone from the casual player to the serious professional, depending on the cue and style. I've been shooting with a Varner cue for over 5 years now and have no complaints. I use an Arizona model cue for tournaments and more important games but I also have a nick Varner signature Sneaky Pete for those "on the road" situations. I have provided Varner one piece cues to several bars in our area and, even with the abuse that bar cues get, they are still in nice shape, not warped or broken. They seem to outlast several of the other bar cue brands I have seen. Almost any billiard supply you need, for your home rec room or for a major billiard hall is available. Check out Nick's website and then get back with me. $22 each. $20 each for an order of 24 or more.